Two years ago, when Eric Zeiberg was 11 years old, a family friend came over for dinner with Eric and his family (pictured at right) at their home in West Hartford. The friend has a wife with muscular dystrophy, and remarked that there was no tool on the market that would translate her handwriting into speech. Half-jokingly, the friend suggested that Eric—who had started experimenting with software programming at a young age—build such a tool. Eric took the suggestion seriously, and within a year—at age 12—he had createdHandySpeech, the first mobile app on the market that provides handwriting-to-speech translation for people with disabilities. It was released by iSpeak4U, a company that Eric’s parents, Boris and Maya Zeiberg, founded around Eric’s product. Since the launch in late 2012, Eric and HandySpeech have received significant press from major news outlets, including NBC and FoxCT. 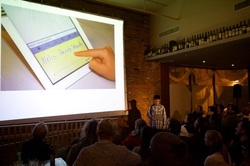 Then, last month—shortly after the launch of HandySpeech 3.0—Eric gave a presentation to a packed house at PechaKucha New Haven. Before an audience of well over 100 people, his presentation was so clear, and his performance so self-possessed, that it was easy to forget Eric’s age and overlook the remarkableness of what he had done. “I hope Handyspeech provides much-needed help and new opportunities to people in need,” he told the crowd. It is already clear that it has. HandySpeech translates handwritten and typed messages into speech. Users can write with a finger or a stylus on the touch screen of their iPhone or iPad, and HandySpeech will convert what they write into speech instantly. The app learns as it goes, recognizing a user’s common phrases and storing them for easy reuse. Users can also write message for later use. The app is multi-lingual: As Eric joked during his PechaKucha presentation, “While I can speak three languages, kind of, Handyspeech can already speak 13.” There are both male and female voices for most of those languages. The software Eric developed relies on two preexisting softwares: a handwriting-recognition software from PhatWare and a text-to-speech software from iSpeech. As Eric’s father, Boris, explained, Eric’s innovation was to combine these two softwares into a single product—one which, he said, remains unique on the market. HandySpeech has proved helpful for people with a wide range of speech-impairing illnesses and disabilities, including stroke victims and people who suffer from brain diseases, Lou Gerhig’s disease, muscular dystrophy, autism, and throat or mouth cancer. It sold close to 200 copies in its first year, at a price of $29.99. Organizations such as the American School for the Deaf and the Oral, Head, and Neck Cancer Support Group at Manchester Memorial Hospital have invited Eric to speak about his product. Boris and Maya—both Russian-born and with engineering backgrounds—are advising Eric and handling business development. A major focus now, they say, is improving the app’s analytics and getting more customer feedback through the new version of the app. The wife of one HandySpeech user, for instance, wrote a note to Eric saying that HandySpeech had radically improved her and her husband’s lives. “I can now have a conversation with my best friend,” she said. Eric’s story is remarkable not merely because he was able to program a complicated app at such a young age, but because he chose to devote his energies to a product that would fundamentally change the lives of people who are all-too-often neglected. He did this because he empathized with the plight of his family friend and his wife with muscular dystrophy. 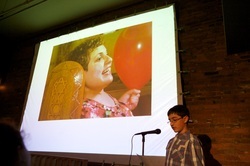 Eric’s older sister, Julie (pictured above), was born with a form of autism that makes it impossible for her to communicate in speech or writing. 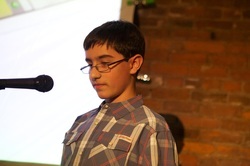 As Eric noted in his PechaKucha presentation, from the moment he gained awareness of the world, he felt like Julie’s older brother. He understood, at a very young age, the heartache that such incommunicability causes to a person and a family. Fueled by that empathy, he set about building a complicated app in a programming language that the he didn’t yet know—learning virtually everything on his own. In a little over a year—from November 2011 to December 2012—he taught himself Objective-C (the programming language used for developing iOS applications), built a simpler app as an experiment (a rudimentary calucator with text-to-speech capabilities), figured out how to utilize preexisting softwares, and uploaded the HandySpeech app onto the App Store. Eric utilized the wealth of online tutorials avaiable to developers, but the most important element of his self-teaching was having definite projects to work on. Eric attends King Phillip Middle School in West Hartford, and told us that he loves math, science, and technical subjects. Outside of school, he spends his time playing sports, working on HandySpeech, and “coding random stuff.” He has ideas for other handwriting-related apps, he says, but his priority right now is on perfecting HandySpeech. He said the 14 months since HandySpeech’s launch have been exciting and surprising. Learn more about HandySpeech and Eric on the iSpeak4U website and follow the HandySpeech on Twitter.